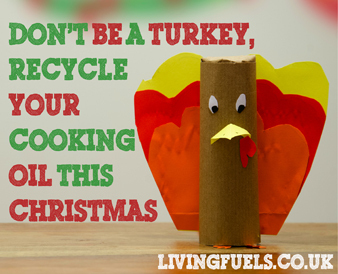 Turn your used cooking oil into energy by recycling it at one of the county’s household recycling centres this Christmas. Shropshire Council and its recycling contractor Veolia have partnered with Living Fuels to transform the oil into much needed renewable energy. Five household recycling centres in Shropshire have been fitted with tanks to collect cooking oil, which is then taken to a facility where it is transformed into an environmentally friendly bioliquid that is fed into generators to produce renewable energy for the National Grid. Rob Murphy, Operations Director at Living Fuels who operate the plant that recovers the oil explains: "Turning cooking oil into a chemical-free bioliquid results in higher levels of energy recovery than manufacturing carbon-hungry biodiesel, making our process the most sustainable use of waste vegetable oil. Cooking oil recycling is available at the following Household Recycling Centres: Whitchurch, Shrewsbury, Craven Arms, Bridgnorth and Oswestry.